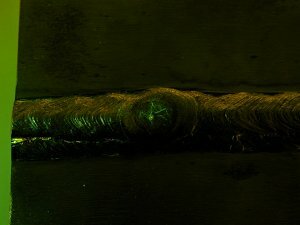 Conventional fluorescence photographic techniques for magnetic particle and liquid penetrant indications require darkness and relatively long exposure times. In contrast, the FPS-1 system makes images instantly and the short exposure times do a great job of minimizing the effect of ambient light. The system works out of the box and requires no set-up time, no tripod, no time exposure. The result is photographs taken in the light that look like they were taken in the dark! We recently took a series of pictures to demonstrate the ability of the system to make high quality fluorescence images even outdoors in full sun. The test is described in the text and pictures below. The bottom line – at most it required casting a shadow on the subject to get the shot, and some images even worked well without any shade at all. NOTE - This page is available as a pdf download. 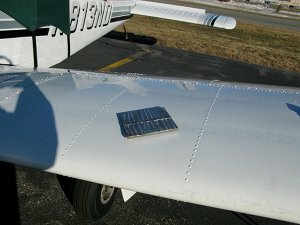 The test was conducted on a sunny day at Hanscom Field, an airport near BlueLine NDT's home base in Bedford, MA. 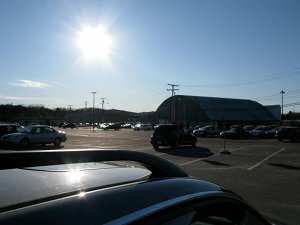 This picture shows the position of the sun in the near-cloudless sky. 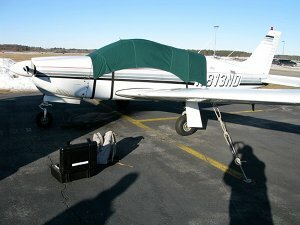 A small plane parked on the ramp was used as the background for the tests. Note the strong shadows. 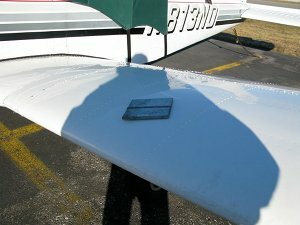 The test subject was a Sonaspection test plate placed on the wing of the plane in full sun. 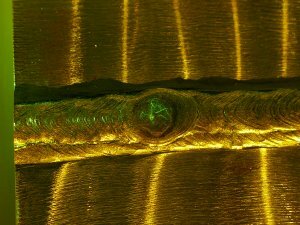 Note the bright streaks caused by reflections from machining marks on the plate. These will appear in the photographs taken in full sun. and standing so that his body casts a shadow on the subject. 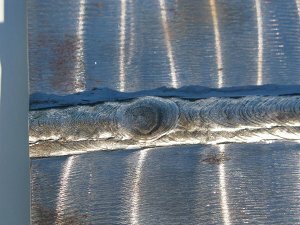 There are fine cracks in the depression on top of the weld. They were prepared with penetrant using Magnaflux ZL67 followed by wiping with an alcohol swab. No developer was used. 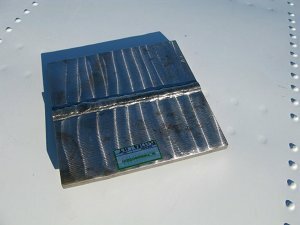 This photograph was taken with the test plate in full sun (note the bright streaks from the machining marks). Even though the background light is very evident the penetrant indications can be seen easily. The background appears yellow because of the yellow filter on the camera. This photograph was taken with the photographer casting a shadow on the subject. The background illumination is greatly reduced and the indications are more evident. 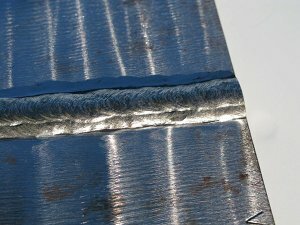 There is a flaw in the toe of the weld, on the side facing the camera. The flaw was prepared with orange-fluorescent Circle DP93 magnetic particles using an AC yoke. 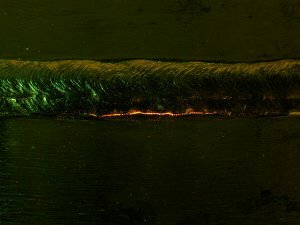 This photograph was taken with full sun exposure of the plate (note the bright streaks from the machining marks). 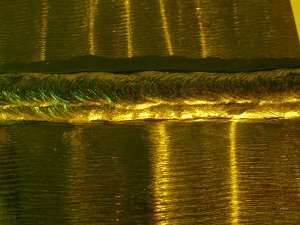 The magnetic particles are not bright enough to be seen against the ambient light. This photograph was taken with the photographer casting a shadow on the subject. The background illumination is greatly reduced and the orange fluorescence from the indication is now easily visible.